Welcome to Spaightwood Galleries, Inc.
Our Chagall pages are arranged thematically and/or by series and illustrate over 200 different etchings and lithographs. Clicking on the links will bring you to one or more pages on that subject. 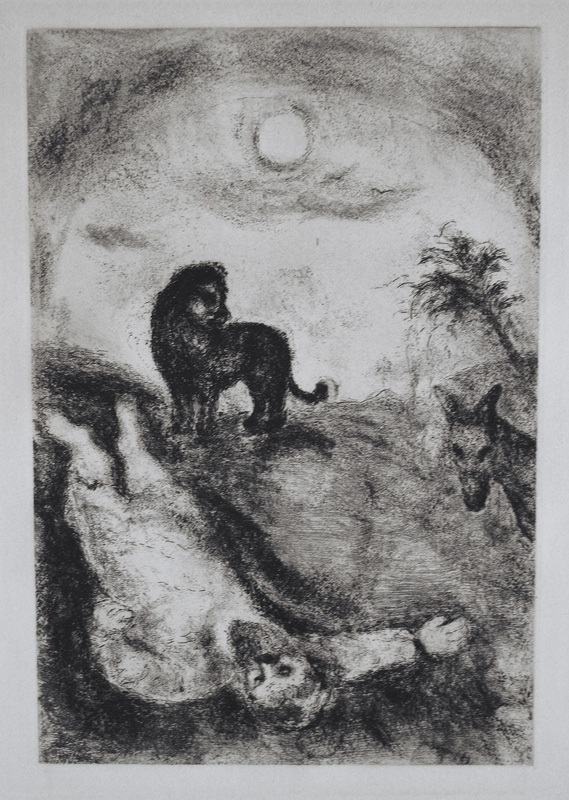 After Chagall completed his etchings for The Fables (1930), Vollard again offered Chagall a commission, this time for a set of etchings illustrating themes from the Bible. Chagall went to Palestine to get a sense of the land itself. Returning to Paris, he began work on the 105 etchings for this project, first between 1931 and 1939 (when the first sixty-five etchings were executed and printed) and then between 1952 and 1956 (when the remaining forty etchings were completed and printed). 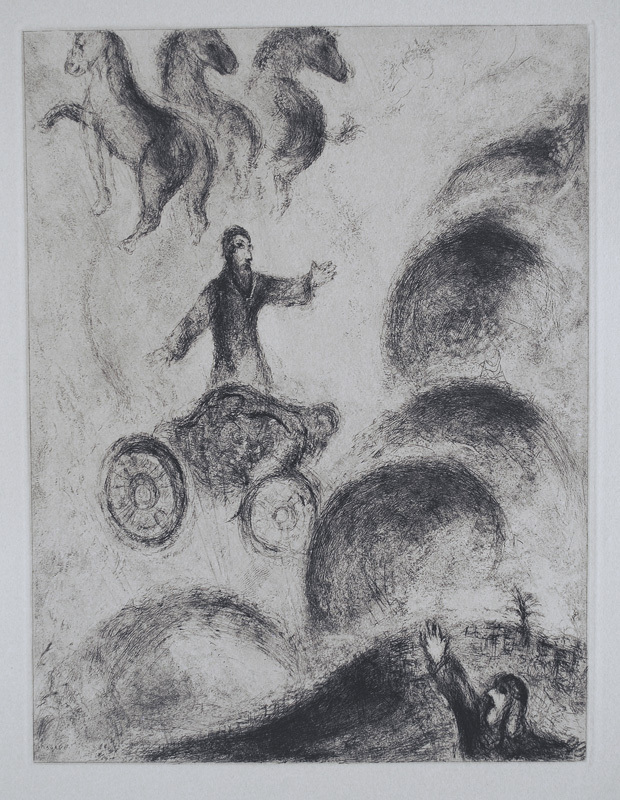 Meyer Schapiro, the noted art historian, observed that Chagall was the ideal artist to have undertaken the task of illustrating the Bible: "Chagall was prepared for this achievement by his permanent receptivity of mind. He is a rare modern painter whose art has been accessible to the full range of his emotions and thoughts. . . . He has represented themes of an older tradition not in a spirit of curiosity or artifice, but with a noble devotion. . . . Although these etchings are marvels of patient, scrupulous craftmanship, there is no assertion here of skill or technical research, but an immersion in a subject which the artist convinces us often equals or transcends value in the work of art . . . In almost every image we experience the precise note of his emotion, his awe or sadness or joy, which is voiced in the melody of shapes and the tonal scale peculiar to each conception. If we had nothing of Chagall but his Bible, he would be for us a great modern artist." 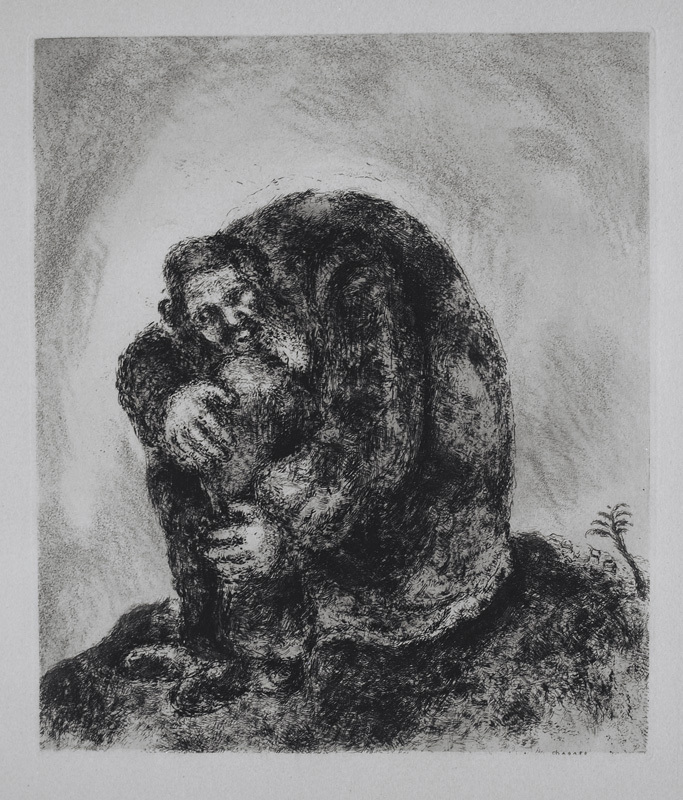 Most of the etchings for The Bible were executed by Chagall between 1931 and 1939; the last pieces were completed between 1952 and 1956. The Bible was issued in an edition of 275 signed and numbered portfolios and 20 portfolios hors commerce. There are also 100 sets of the etchings with hand-coloring, each of which is initialed in pencil by Chagall. The paper size of all of the etchings for the Bible is 440x330mm (17-1/4x12-1/8 inches). The paper is white, but in some cases it reproduced darker than it should have in our photographs on our three web pages devoted to the etchings for the Bible. L'onction de Salomon / Solomon annointed King (H. 352, S. 273). Original etching, 1931-1939; printed 1939. 100 signed and numbered hand-colored impressions plus 295 black and white impressions signed in the plate in the upper right, of which this is one. Annotated "76" lower left to indicate tht this is plate 76 of the 100 etchings in the series. Solomon, already crowned, is escorted into Jerusalem by a jubilant crowd. In very good condition except for a very slight discoloration about 3/8 inch from the platemark. 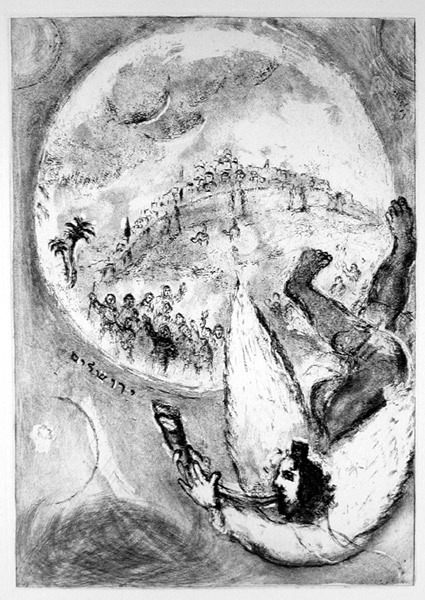 Illustrated in Marc Chagall Druckgraphik (Westfalisches Landesmuseum fur Kunst und Kulturgeschichte Münster, 1985). Image size: 285x237mm. Price: $5500. La Reine de Séba / Solomon greets the Queen of Sheba (H. 355, S. 278). 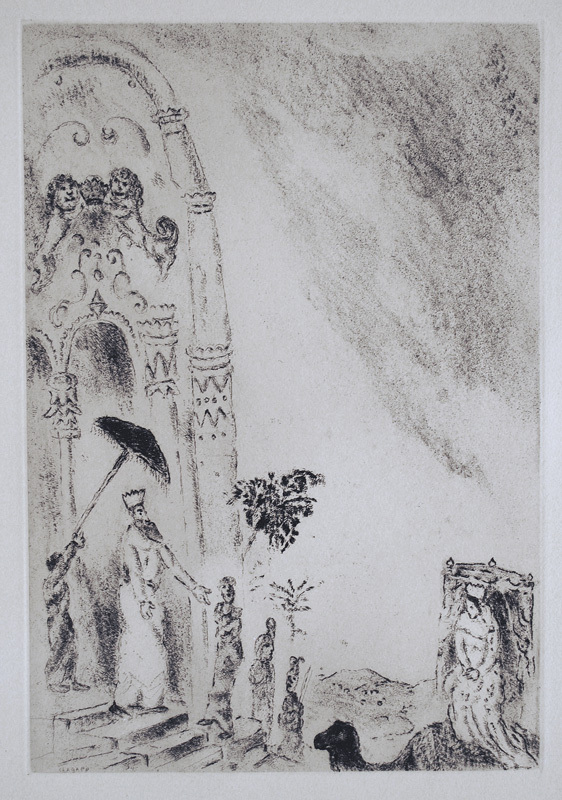 Original etching, 1931-1939; printed 1939. 100 signed and numbered hand-colored impressions plus 295 black and white impressions signed in the plate lower left, of which this is one. Illustrated in Musée National Message Biblique Marc Chagall (1977) and Marc Chagall Druckgraphik (Westfalisches Landesmuseum fur Kunst und Kulturgeschichte Münster, 1985). Image size: 319x219mm. Price: $5500. Disobedient Prophet killed by a Lion (H. 357, S. 282). Original etching, 1931-1939; completed 1952-1956. 100 signed and numbered hand-colored impressions plus 295 black and white impressions signed in the plate lower right, of which this is one. The scene depicts 1 Kings 13: 24, where a prophet who ignored God's instructions is kiled by a lion. 2 small spots well outswide of the placemark in the left and right margins not affecting the image. Image size: 317x216mm. Price: $3950. Elijah on Mt. Carmel (H. 361, S. 288). Original etching, 1931-1939; completed 1952-1956. 100 signed and numbered hand-colored impressions plus 295 black and white impressions signed in the plate lower right, of which this is one. Illustrated in Meyer, Chagall's Graphic Works, Nice 1987, and the MoMA catalog, Ambroise Vollard Editeur Image size: 285x248mm. Price: $5000. 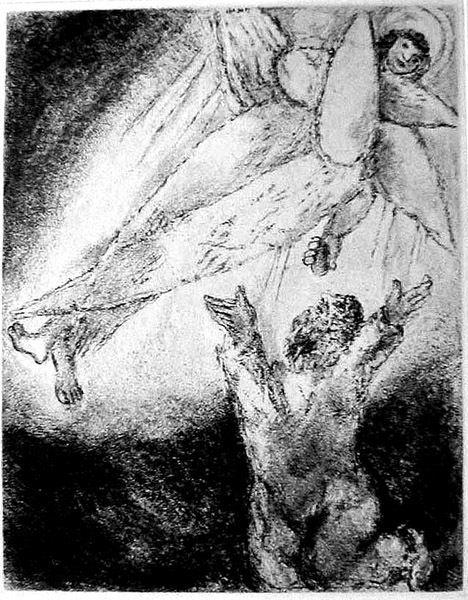 Elie enlevé au ciel / Elijah taken up into Heaven (H. 364, S. 284). 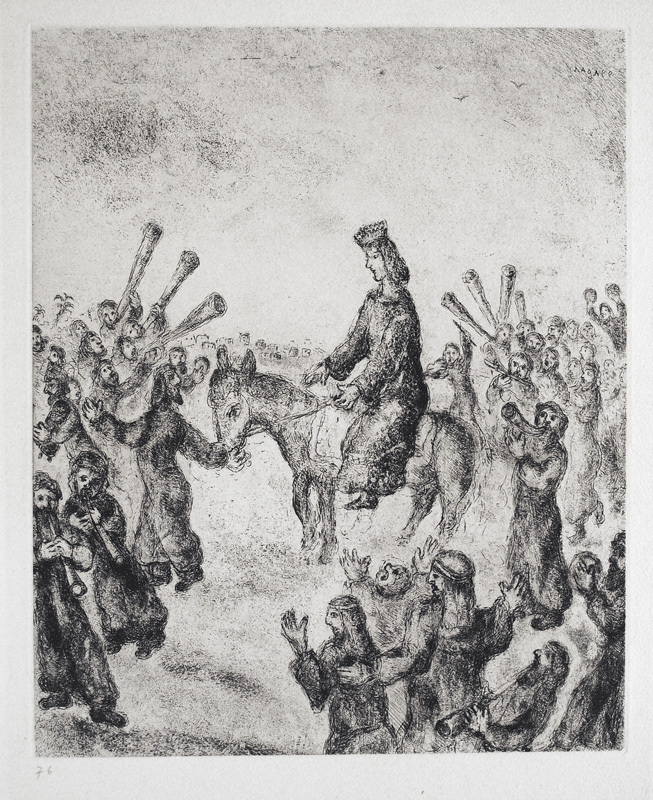 Original etching, 1931-1939; printed 1939. 100 signed and numbered hand-colored impressions plus 295 black and white impressions signed in the plate lower left, of which this is one. At bottom right, Elisha reaches out for Elijah's cloak which is falling towards him. Illustrated in Musée National Message Biblique Marc Chagall (1977) and Marc Chagall Druckgraphik (Westfalisches Landesmuseum fur Kunst und Kulturgeschichte Münster, 1985). Image size: 319x244mm. Price: $6000. L'Eternal aura pitié de Jacob / God will have mercy on the people of Jacob (H. 369, S. 292). Original etching, 1931-39; completed 1952-1956. 100 signed and numbered hand-colored impressions plus 295 black and white impressions signed in the plate both bottom left and bottom right, of which this is one. 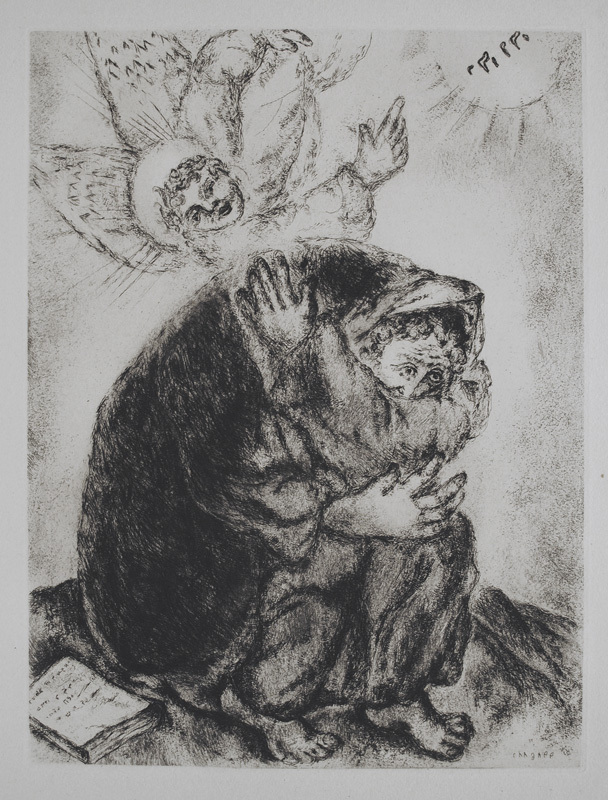 Chagall's image is based on Isaiah 52: 1-7 and reminds us that God has promised to have mercy on Jacob (who was renamed "Israel"). Image size: 315x221mm. Price: $6000. Man's steps guided by the Lord (H. 372, S. 295). Original etching; 1931-39; printed 1939. 100 signed and numbered hand-colored proofs plus 295 black and white impressions signed in the plate, of which this is one. 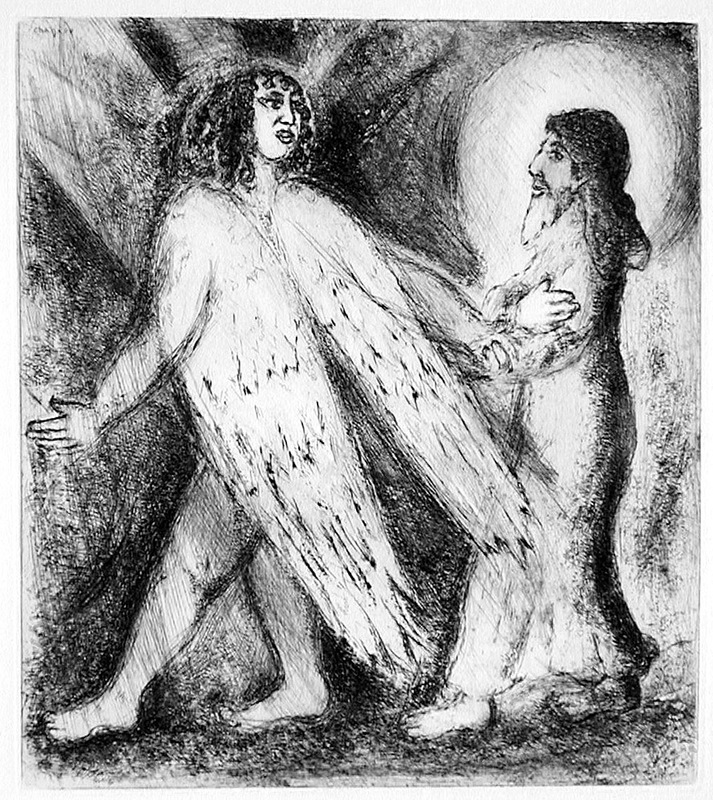 Chagall's text is Isaiah 58:8-11. Image size: 279x249mm. Price: SOLD. Isaiah's Prayer (H. 374, S. 297). Original etching, 1931-1939; completed 1952-1956 100 signed and numbered hand-colored impressions plus 295 black and white impressions signed in the plate lower right, of which this is one. 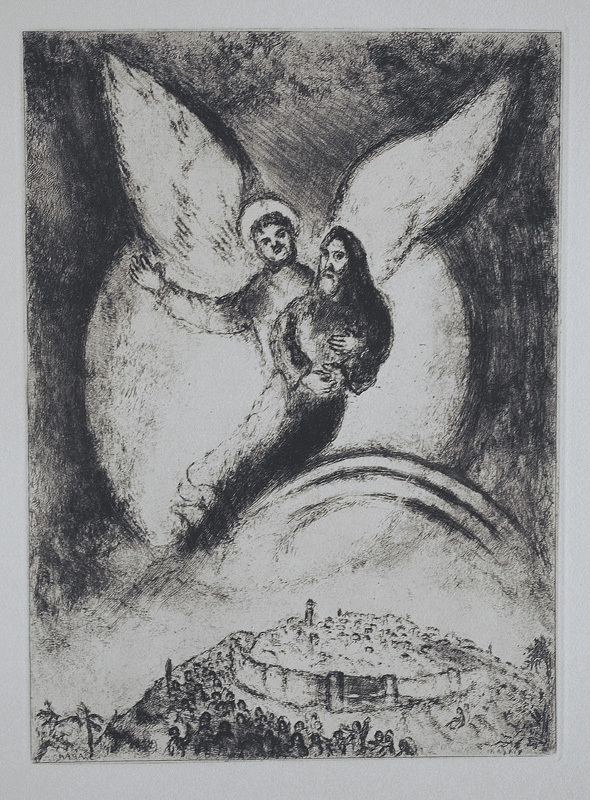 One of 15 etchings from the Bible (of 106) included in the 1970 Bibliotheque Nationale show of Chagall's graphic works. Image size: 326x247mm. Price: $5500. We accept AmericanExpress, DiscoverCard, MasterCard, and Visa. We also accept wire transfers and paypal. For directions and visiting information, please call. We are, of course, always available over the web and by telephone (see above for contact information). Click the following for links to past shows and artists. For a visual tour of the gallery, please click here. For information about Andy Weiner and Sonja Hansard-Weiner, please click here. For a list of special offers currently available, see Specials. All works are sold with an unconditional guarantee of authenticity (as described in our website listing. Go back to the top of this page. Visiting hours: Saturday 10:00 am to 5:00 pm and Sunday noon to 6:00 pm and other times by arrangement. Please call to confirm your visit. Browsers and guests are welcome.